This pink Breast Cancer Awareness Mag-Lite ® Solitaire promotional flashlight is the perfect solution for an awareness promotion. 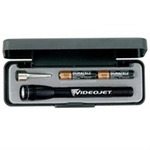 3.25 inch long MAG-LITE ® promotional flashlight. Small yet powerful! The promo flashlight that changed the world now in digital camouflage pattern! 3 D-Cell MAG-LITE custom flashlight, 12-3/8 inches long. The promotional flashlight that changed the world! 2 C-Cell MAG-LITE® custom flashlight, 9 inches long. 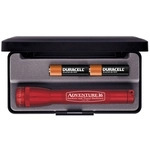 4 D-Cell MAG-LITEs ® promotional flashlight, 14.75" long. Bring a little light into your clients' lives with MAG-LITE Engraved promotional flashlights from ePromos. These wholesale flashlights are so strong and dependable that they are the choice flashlights for emergency, medical and security professionals around the world. Made out of quality materials, these custom flashlights are engineered to last a lifetime.